This week I started reading Rob Walling’s book on software startups, Start Small, Stay Small. One of the points Rob makes early in the book is it’s best to start focused on a niche. Being niche-focused allows you to compete with well-funded products which often solve broad or multiple problems. NanaGram‘s niche is sharing photos with grandparents. We help you mail monthly printed photos with just a text message or email. My 94-year-old grandparents (twice great-grandparents) were the first NanaGram recipients. My brother and I built the initial version for fun, as a gift to our grandfather on his 94th birthday. We compete with digital giants like Facebook and Instagram and print giants like Walgreens, CVS, Walmart, Shutterfly, Snapfish, Groovebook, and Amazon. I say “we” when in reality NanaGram is currently a one-man shop. Because of the niche focus, I’ve been able to make a product hundreds of people love on my own, with no outside funding. (Not without moral support from my family, friends, and customers — especially my brother Andy, who is cranking away on Tettra.) One way I’ve done this is by building features specific to grandparents which the giants would never build, like NanaGram’s cover photo. Over the years, my three siblings and I have been fortunate to have very involved grandparents. We saw them at holidays, birthdays, and they came to almost all of our sporting events, recitals, boy scout events, and more. My Mom raised us to do a good job keeping in touch with our grandparents at a distance. Any time they gave us a gift, we sent a thank-you note. When we traveled, we sent a postcard. We talked on the phone. As we became adults and our grandparents entered their 80s and 90s, we continued these good habits. Due to his hearing loss as a child, my grandfather was never able to have a full conversation on the phone. My grandmother was a career telephone operator and loves talking on the phone. Whenever we’d call, she’d relay updates to our grandpa. My youngest brother Adam became an Eagle Scout. 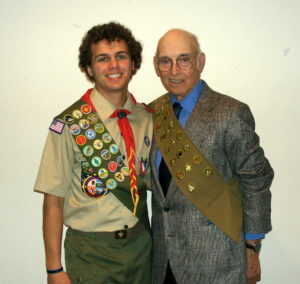 My grandfather, also an Eagle, came to the ceremony proudly wearing his sash. I made the first NanaGram photo delivery to my 94-year-old grandparents in-person. They were ecstatic. 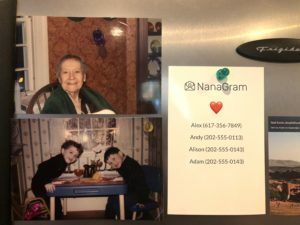 This was the first time they had fresh printed photos from each of their grandkids at once. My grandma asked me to write down everyone’s phone number so she could call my siblings and thank them. Her phone book seemed to always be missing. This wasn’t the first time she asked. As I wrote down their numbers for what seemed like the 50th time by hand, I decided at that moment to build the first version of the NanaGram cover photo. The idea was pretty simple. I’d print the names and phone numbers of everyone on the account on a photo and add it to the top of the stack. Our cover photo displaying names and phone numbers. About a month later, I realized I was the only lucky one to get mail from Grandma in her 90s. 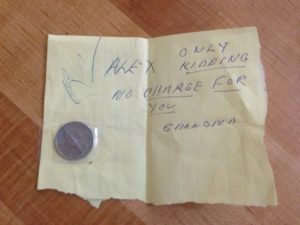 Years ago my Grandma became Reddit famous for a day for a note she sent me in the mail containing a quarter. My siblings didn’t get as much mail as I did, mainly because in the past decade I’ve stayed put while my brothers have moved around. Grandma could never seem to find their current addresses. I improved the cover photo more, allowing customers to optionally list their shipping address in addition to their phone number. Because who doesn’t love getting stuff in the mail from their grandparents? Visiting my awesome 90-year-old grandparents last week and asked, “Can I use your rest room?”, to which my Grandma replied, “for 25 cents!”. So I left a quarter next to the toilet just for fun and got this in the mail today. When they get a NanaGram delivery in the mail, many recipients call everyone listed on the cover photo. This is important for me personally. Because while as a business we make money by printing and shipping photos, my personal measure of success is whether the product helps spark more regular and meaningful connections between loved ones. Niche features like our cover photo have created so many magical moments for NanaGrammers. Hearing about these moments has also helped me push forward when things get tough — startups aren’t easy. I plan to stay focused on this niche for a while. It feels like I’ve just started scratching the surface. Thanks to Tadas Antanavicius, Bob Lowry, Katie Woods and Nelson Joyce, Mike Miklavic, and Adam Cook for reading drafts of this post.